In this era of change, where we often focus on ‘new stakeholders’, the art and science of working with medical experts and ensuring that your relationship is productive for both parties is often neglected. 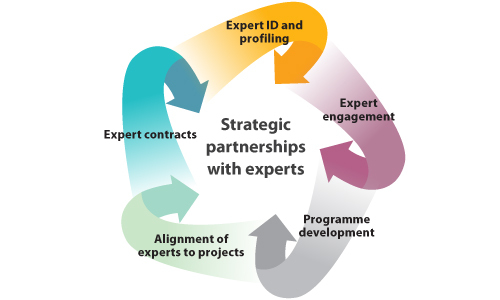 However, there is still an important place for knowing your experts and working with them on carefully chosen projects to ensure a strong partnership. Essentially, medical experts will lead change. For example, it will be these experts who will discuss the appropriate and effective use of new medicines. Similarly, when there are new data in a therapeutic area, it will be the experts who interpret the data and explain to other healthcare professionals what these data mean for their clinical practice. What’s more, experts hold the key to effective working: they are the people who can help you have really good insight into the diseases you are treating and the medicines you are developing/commercialising. For many of the experts, working with pharma not only provides a welcome diversion from their daily routines, but pharma is increasingly seen as an important partner for new trials, important disease awareness campaigns and scientific exchange. Companies who want to be known for scientific leadership should have working with experts as their top priority. What do experts say about working with pharma? So, clearly there is room for improvement! Although not rocket science, we believe a carefully crafted process, adopted by all the team responsible for working with experts, enhances the experience for all parties. We propose a five-stage process to help clients work more effectively with their experts, advancing partnership. Desk research of professional societies, publications’ databases and recent meetings will yield a good list of experts who are important and/or active in the field. However, the list gives you a very one dimensional picture. Our ADVANCE partnership methodology has an extra step: where we find out how each expert exerts his influence on his peers and we understand how each expert likes to work with pharma, his passion for science and enthusiasm for innovation. Once you have understood your group of experts, you can identify a core team who will be motivated to work with you on your strategic goals. It is critical at this stage of your planning to ENGAGE the experts, and work with them to form your plans. By discussing the major questions that experts (and other HCPs) have in the area and by asking about the clinical hot topics and how your brand fits, programmes that add value to your brand and to the medical community will be devised. 4. Right expert, right job! If you have understood your team of experts well, and engaged it in the development of your plans, aligning the right expert to the right programme will be straightforward. In this era of increased scrutiny of both pharma and experts’ relationships with pharma, it is critical to agree and update a plan or contract with each expert in your team at least annually. In summary, working with experts well is not rocket science, but all the steps in the ADVANCE expert alignment model must be followed. This ensures the work you do profits not only you, but the experts and the wider medical community. And it also supports you to advance your partnership with your experts, and this is critical, as you need their support and guidance to help you effect change.